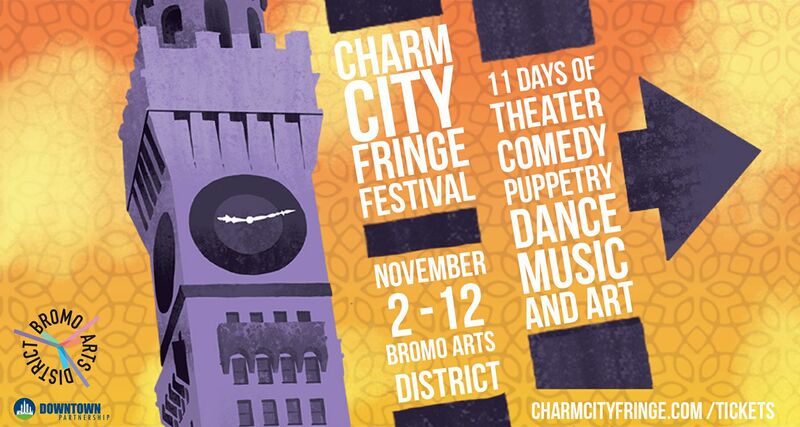 This November, Charm City Fringe Fest will take over the Bromo Arts District of downtown Baltimore, showcasing 26 original acts and more than 90 performances. “This is our sixth year,” Michel says. “My business partner Michael Brush and I are the founders…we were in marching band together,” he remembers with a laugh. Michel and Brush have known each other since 7th grade, and walked a similar path as self-proclaimed “theater nerds” and as well as musicians. of ticket sales go directly to the artists themselves. Another tenet of Charm City Fringe’s mission is to create a space for everyone, from seasoned theater-goers to fringe novices alike, to explore and discover performance art out of the mainstream. By making each performance affordable, CCFF invites viewers on any budget (ahem, students!) to get a chance to open their eyes and minds to new, unconventional artistic expression. This year, CCFF will kick off on Nov. 2 with a launch party at Le Mondo (406 N. Howard St.) from 7 to 9:30 p.m. With the purchase of a $15 ticket (available at charmcityfringe.com), you’ll have the chance to preview performances and meet the fringe artists, as well as enjoy a dance party and refreshments. As for shows to look out for, Michel is particularly excited to see Emil Amok Guillermo’s Amok Monologues: All Pucked Up, Michael Burgos’s Yum, and Fluid Movement’s Druid Hill Haunt: A Chiller Thriller Roller Show(though he had a hard time choosing just a few favorites). CCFF is staffed almost entirely by volunteers. Each shift worked earns you a free ticket to your performance of choice. If you want to get involved in more than just the viewing process, sign up to volunteer on the CCFF website.